A hiatal hernia occurs when the upper part of your stomach bulges through your diaphragm into your chest cavity. A hernia occurs when one part of the body protrudes through a gap or opening into another part. A hiatal hernia forms at the opening in your diaphragm where your food pipe (esophagus) joins your stomach. Part of the stomach pushes through this opening causing a hiatal hernia. Most small hiatal hernias don't cause problems, and you may never know you have a hiatal hernia unless your doctor discovers it when checking for another condition. But a large hiatal hernia can allow food and acid to back up into your esophagus, leading to heartburn and chest pain. Self-care measures or medications can usually relieve these symptoms, although very large hiatal hernias sometimes need surgical repair. Most small hiatal hernias cause no problems. Larger hernias may cause the following signs and symptoms when stomach acids back up into your esophagus. These signs and symptoms tend to become worse when you lean forward, strain, lift heavy objects or lie down, and they can also worsen during pregnancy. The exact cause of hiatal hernias isn't known. Your chest cavity and abdomen are separated by your diaphragm — a large dome-shaped muscle that's responsible for a major part of normal breathing. 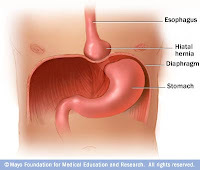 Your esophagus passes into your stomach through an opening in the diaphragm called the hiatus. Hiatal hernias occur when the muscle tissue surrounding this opening becomes weak, and the upper part of your stomach bulges up through the diaphragm into your chest cavity. Some people develop a hiatal hernia after an injury to the area. Others are born with an inherent weakness or an unusually large hiatal opening. But anything that puts intense pressure on your abdomen — including persistent or severe coughing or vomiting, pregnancy, straining while going to the bathroom, increased abdominal fluid or lifting heavy objects — can contribute to a hernia. Children with the condition are usually born with it. Many people discover they have hiatal hernias when they see their doctors about heartburn. Most cases of heartburn are mild and temporary. But if your symptoms are severe, occur often, or are accompanied by coughing, wheezing, asthma, a sore throat, difficulty swallowing or chest pain, talk to your doctor. If you know you have a large hiatal hernia and experience severe chest pain, difficulty breathing or trouble swallowing, seek medical care immediately. Barium X-ray. During this test, you'll drink a chalky liquid containing barium that coats your upper digestive tract. This provides a clear silhouette of your esophagus, stomach and the upper part of your small intestine (duodenum) on an X-ray. A barium X-ray may help reveal whether the contents of your stomach are backing up into your esophagus. Endoscopy. In this test your doctor passes a thin, flexible tube equipped with a fiber-optic light and video camera system (endoscope) down your throat and into your esophagus and stomach to check for inflammation. This not only can help detect a hiatal hernia, but also is the most sensitive way to check for damage to your esophagus from acid reflux. Some large hiatal hernias have lesions in the upper stomach. If severe, these lesions can bleed and lead to iron deficiency anemia from chronic blood loss. Other hernias become so large that one-third or more of the stomach protrudes through the diaphragm, putting extra pressure on the diaphragm or lungs. And occasionally, the part of the stomach that protrudes into the chest cavity becomes twisted or cuts off blood flow to the rest of the stomach, producing severe chest pain and difficulty swallowing. If this occurs, see your doctor without delay. You may require immediate surgical repair of the hernia. A common complication of hiatal hernia is probably gastroesophageal reflux disease (GERD). At one time it was thought that hiatal hernias caused most cases of GERD. Now doctors believe that only larger hiatal hernias play a role. GERD may occur when a hernia slightly displaces the lower esophageal sphincter, a circular band of muscle around the bottom of the esophagus. Ordinarily, the diaphragm is aligned with the lower esophageal sphincter, which relaxes to allow food and liquid to flow into your stomach when you swallow. The diaphragm supports and puts pressure on the sphincter to keep it closed when you're not swallowing. But a hiatal hernia raises the sphincter above the diaphragm, reducing pressure on the valve. This permits the sphincter muscle to open at the wrong time, allowing stomach acid to back up into the esophagus. A hiatal hernia can also cause heartburn if the herniated portion of your stomach becomes a reservoir for gastric acid, which can then easily travel up your esophagus. Difficulty swallowing. Stomach acid backing up into your esophagus can cause inflammation and scarring. This narrows your esophagus, making it hard for you to swallow. Barrett's esophagus. Occasionally, people with GERD develop Barrett's esophagus from repeated, long-term exposure to stomach acid. In this condition, cells similar to those in the stomach lining develop in the lower esophagus. If you have Barrett's esophagus, you're at increased risk of developing esophageal cancer. A doctor who specializes in stomach and intestinal problems (gastroenterologist) can advise you how best to manage the condition to lessen this risk. Esophageal cancer. Most people with Barrett's esophagus don't develop esophageal cancer, but for those who do, the prognosis is often poor. An esophageal tumor makes swallowing increasingly difficult and for some people, eventually impossible. If you don't have any signs or symptoms from a hiatal hernia — and most people don't — you probably won't need any treatment. But if you're experiencing recurrent gastroesophageal reflux, you may get relief from a few simple changes in your lifestyle. If you're overweight, losing weight alone may relieve your symptoms. Antacids. Over-the-counter antacids (Maalox, Mylanta, Tums) can neutralize the acidity in your esophagus and provide relief from heartburn. Keep in mind that these medications don't cure heartburn — they merely relieve symptoms. Once you stop taking antacids, your symptoms usually return. H-2 blockers. These medications reduce the amount of acid secreted by your stomach by blocking histamine receptors. They include famotidine (Pepcid), cimetidine (Tagamet), ranitidine (Zantac) and nizatidine (Axid), which are available over-the-counter. If you have more severe heartburn or esophagitis, your doctor may prescribe stronger doses of H-2 blockers. It's best to take these medications before a meal that may give you heartburn. You can also take them after symptoms occur, but it takes about 30 minutes for them to work. Your doctor may recommend that you take an acid blocker for a few months, or longer. Occasionally you may experience some side effects, such as bowel changes, dry mouth, dizziness or drowsiness. In addition, H-2 blockers shouldn't be taken with certain other medications because of the risk of a serious interaction. If you use an acid blocker and also take other medications, check with your doctor or pharmacist about possible drug interactions. Proton pump inhibitors (PPIs). These drugs — which include lansoprazole (Prevacid), pantoprazole (Protonix), rabeprazole (Aciphex), omeprazole (Prilosec) and esomeprazole (Nexium)— are the most effective drugs for the treatment of GERD. They block acid production and allow time for damaged esophageal tissue to heal. They're also convenient because you take them only once a day. But they're more expensive than other GERD medications. Proton pump inhibitors are generally safe and tend to be well tolerated, even for long-term treatment. To prevent possible side effects, such as stomach or abdominal pain, diarrhea or headache, your doctor is likely to prescribe the lowest effective dosage. Check with your doctor or pharmacist about possible drug interactions if you're taking other medications. A few people with a hiatal hernia may need surgery. This is usually considered only when medications and lifestyle changes fail to relieve severe reflux symptoms, or if you have complications such as chronic bleeding or narrowing or obstruction of your esophagus. Large hiatal hernias may also need repair if they cause symptoms such as shortness of breath, difficulty breathing or swallowing, or chest pain. An operation for a hiatal hernia may involve pulling your stomach down into your abdomen and making the opening in your diaphragm smaller, reconstructing a weak esophageal sphincter, or removal of the hernia sac. In some cases, this is done using a single incision in your chest wall (thoracotomy) or abdomen (laparotomy). In other cases, your surgeon may insert instruments and a fiber-optic camera through several small incisions in your abdomen. The operation is then performed while your surgeon views the images on a video monitor (laparoscopic surgery). Laparoscopic surgery generally causes less pain and scarring and requires a shorter hospital stay than does thoracotomy or laparotomy. The procedure that's best for you may be determined by the kind of hernia you have and the experience of your surgeon. Eat small meals. Large meals can distend your stomach, pushing it into your chest. Avoid problem foods and alcohol. Try to avoid alcohol, caffeinated drinks, chocolate, onions, spicy foods, spearmint and peppermint — all of which increase production of stomach acid and relax the lower esophageal sphincter. Even decaffeinated coffee can be irritating to an inflamed esophageal lining. Also try to limit citrus fruits and tomato-based foods. They're acidic and can irritate an inflamed esophagus. Limit fatty foods. Fatty foods relax the lower esophageal sphincter and slow stomach emptying, which increases the amount of time that acid can back up into your esophagus. Sit up after you eat. Wait at least three hours before going to bed or taking a nap. By then, most of the food in your stomach will have emptied into your small intestine, so it can't flow back into your esophagus. Eating a bedtime snack stimulates acid formation and further aggravates acid reflux. Don't exercise immediately after eating. Try to wait at least two to three hours before you engage in any strenuous activity. Low-key exercise, such as walking, is fine. Lose weight. If you're overweight, slimming down helps reduce the pressure on your stomach. This may well be the most important thing you can do to relieve your symptoms. Stop smoking. Smoking increases acid reflux and dries your saliva. Saliva helps protect your esophagus from stomach acid. Avoid certain medications, if possible. Medications to avoid include calcium channel blockers; the antibiotic tetracycline; nonsteroidal anti-inflammatory drugs, such as aspirin, ibuprofen and naproxen sodium; quinidine; theophylline; sedatives and tranquilizers; and alendronate. If you take any of these medications and have heartburn, talk to your doctor. You may be able to take other drugs instead. Elevate the head of your bed. If you elevate the head of your bed six to nine inches, gravity will help prevent stomach acid from moving up into your esophagus as you sleep. Using a foam wedge to raise your mattress also may help. Don't try to use pillows, which tend to increase pressure on your abdomen. Avoid tightfitting clothes. They put pressure on your stomach. Take time to relax. When you're under stress, digestion slows, which makes GERD symptoms worse. Relaxation techniques such as deep breathing, meditation or yoga may help reduce acid reflux.